Video game designer Shigeru Miyamoto introduces Nintendo's Super Mario Maker at the Electronic Entertainment Expo in Los Angeles in 2014. Nintendo's Mario games, in their various forms and genres have been played around the world by hundreds of millions of people. In the original, Mario is a plumber who must speed through the Mushroom Kingdom to rescue Princess Toadstool. The game turns 30 this year. Its famed creator, Shigeru Miyamoto, was in Los Angeles this week at the big Electronic Entertainment Expo video game conference to promote the latest version of the game Super Mario Maker. I had a chance to meet up with him and talk about his popular character and games. My first question was how a Japanese game designer came up with a character who looks like a white guy in overalls with a big nose, a mustache and a cap. "When I was younger I used to enjoy comics and drawing comics," says Miyamoto. "And among the comics that I read, some were Italian comics. So I think that my connection to those Italian comics probably drew on that inspiration when we first drew the character." And Mario didn't start out as a plumber — he was a carpenter in Nintendo's first big hit, Donkey Kong, also created by Miyamoto, which first came out as an arcade game in 1981. In Donkey Kong, the character must climb ladders to rescue a princess from a gorilla. Miyamoto says he got named Mario when the game shipped to the U.S.
"There was somebody related to that warehouse whose name was Mario," says Miyamoto. "And the staff at Nintendo in America said that the character looked like the individual named Mario. So they started calling the character Mario, and when I heard that I said 'oh, Mario's a great name — let's use that.' "
The name and the character are part of the core storyline of a franchise that has helped Nintendo thrive for decades. Mario became a plumber in Miyamoto's next game, because he had to make his way through a series of pipes. He became Super Mario when Miyamoto added mushrooms that make Mario grow bigger and stronger. "If you think about stories like Alice in Wonderland or other types of fairy tales, mushrooms always seem to have a kind of mysterious power," says Miyamoto. "And so we thought that the mushroom would be a good symbol why they get it and then grow big." Mario grows big so he can overcome obstacles, including exploding Bob-omb's, and bad mushrooms called Goombas. Despite the fantastical nature of Miamoto's games, he was trained as an industrial designer, so he often thinks of new ways to play his games from what he sees in his life. When Miyamoto took up swimming he brought his style to the way Mario swam in Super Mario 64. Miyamoto's imaginative and childlike universe has spawned more than 200 games in various genres. Game developers revere Miyamoto. Dan Herd, who makes games for Playful, says he looks to Mario and other games by Miyamoto for inspiration. "I would never call Mario a kids game or a mascot that only kids understand," says Herd. "It taps into fundamental building blocks of play. It's fun to jump and it's fun to run and feel free and fly up into the sky and all those things." 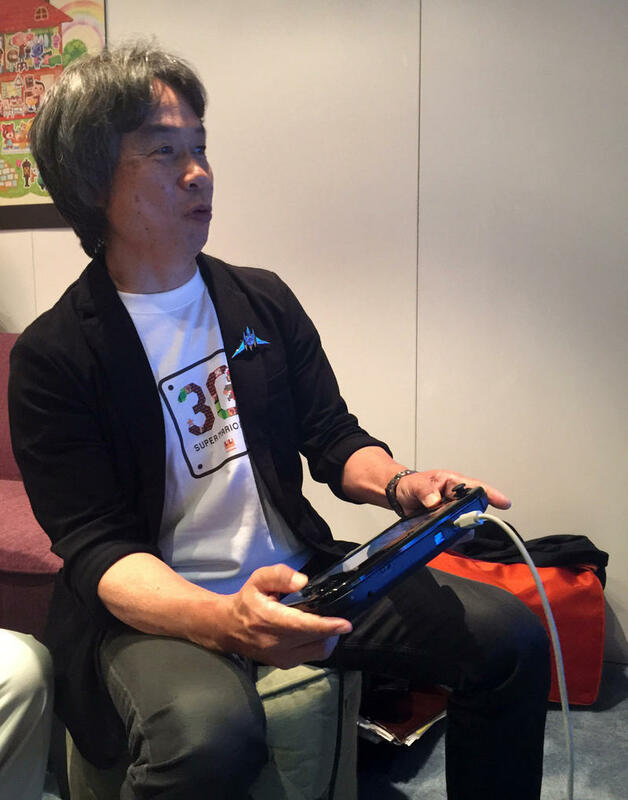 At 62, Miyamoto remains a playful person. He is slim, with a page boy hair cut, and a twinkle in his eyes. Lately he's showing off the newest addition to the Mario franchise, Super Mario Maker, which allows players to use the backgrounds and characters to make their own levels. "You can make courses from scratch with Super Mario Maker," he explains. "Or you can edit courses that already exist within the game." I asked Miyamoto to make a game for me. He was more than happy to do it, even though I wanted a super-easy course. I played rather nervously with the actual maker looking over my shoulder, but with his assistance I won. Super Mario Maker is on the latest Nintendo console, the Wii U, which hasn't sold well, but Nintendo says those who love the playful designs of Miyamoto's games may soon see Mario and other popular Nintendo characters in games for tablets and mobile phones. And that is the theme song from one of the most popular video games of all time. "Super Mario Brothers" has been played around the world by hundreds of millions of people. The game premiered 30 years ago. Mario is a plumber who must speed through the Mushroom Kingdom to rescue Princess Toadstool. NRP's Laura Sydell met up with its famed creator Shigeru Miyamoto here in Los Angeles this week at a big video game conference, the Electronic Entertainment Expo. LAURA SYDELL, BYLINE: The first question I had for Shigeru Miyamoto and his translator was how it is that a Japanese game designer came up with a character that looks like a white guy in overalls with a big nose, a mustache and a cap. SHIGERU MIYAMOTO: (Through interpreter) When I was younger, I used to enjoy comics and drawing comics as well. And among the comics that I read, some were Italian comics. And so I think that my connection to those Italian comics probably I drew on that inspiration when we first drew the character. SYDELL: And Mario didn't start out as a plumber. He was a carpenter in Nintendo's first big hit "Donkey Kong," also created by Miyamoto, that first came out as an arcade game in 1981. SYDELL: In "Donkey Kong," the Mario character is a carpenter who must climb ladders to rescue a princess from a guerrilla. Miyamoto says he got named Mario when the game shipped to the U.S.
MIYAMOTO: (Through interpreter) There was somebody related to that warehouse whose name was Mario, and the staff at Nintendo in America said that the character looked like the individual named Mario. And so they started calling the character Mario, and when I heard that, I said oh, Mario's a great name; let's use that. SYDELL: The name and the character are part of the core storyline of a franchise that has helped Nintendo thrive for decades. Mario became a plumber in Miyamoto's next game because he had to make his way up through a series of pipes. He became Super Mario when Miyamoto added mushrooms that made Mario grow bigger and stronger. MIYAMOTO: (Through interpreter) If you think about stories like "Alice In Wonderland" or other types of fairytales, mushrooms always seem to have sort of a mysterious power. And so we thought that the mushroom would be a good symbol for why they get it and they grow big. SYDELL: Mario grows big so he can overtake obstacles like exploding Bob-ombs. SYDELL: Despite the fantastical nature of Miyamoto's games, he was trained as an industrial designer, and so he often thinks of new ways to play his games from what he sees in his life. "Super Mario 64" got his swimming style when Miyamoto began to swim for exercise. MIYAMOTO: (Through interpreter) I drew on a lot of my experience swimming in creating the underwater swimming scenes with Mario in that game. SYDELL: Miyamoto's imaginative and childlike universe has spawned over 200 Mario games in various genres. Game developers revere Miyamoto. Dan Herd makes games for Playful, and he looks to Mario and other games by Miyamoto for inspiration. DAN HERD: I would never call Mario a kids' game or a mascot that only kids understand. It taps into fundamental building blocks of play. It's fun to jump and it's fun to run and feel free and fly up into the sky and all those things. 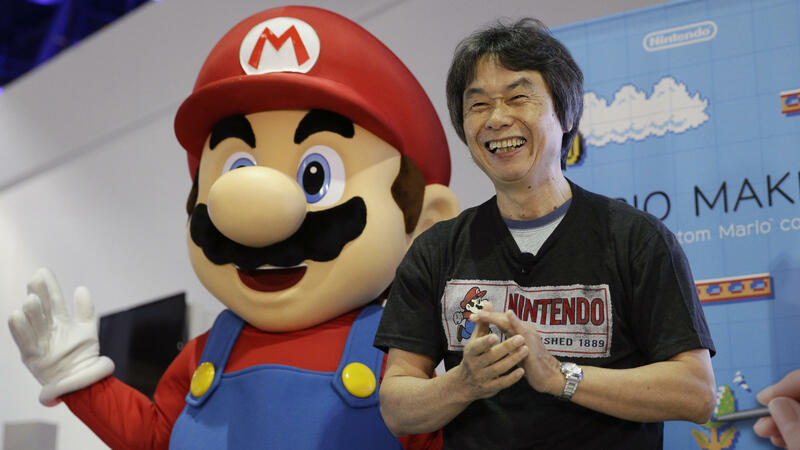 SYDELL: At 62, Miyamoto remains a playful person. He's slim with a pageboy haircut and a twinkle in his eyes. He sat down with me to show off the next release in the Super Mario franchise. It's called "Super Mario Maker," and it allows players to use the backgrounds and characters to make their own levels. UNIDENTIFIED MAN: So you can create courses from scratch with "Super Mario Maker," or you can edit courses that already exist within the game. SYDELL: Can they make me a course that's for people who are really bad? Miyamoto and his assistant set up to make me my own course level and they seem to be enjoying themselves. UNIDENTIFIED MAN: So to make this a little bit easier, we're going to erase some of these enemies. SYDELL: It made me really nervous to play "Super Mario Maker" with the actual maker smiling over my shoulder. UNIDENTIFIED MAN: You can come go up above. SYDELL: Up above - oh, no. Like as in there? I should have gone through the pipe. Unfortunately, "Super Mario Maker" is on the latest Nintendo console, the Wii U, which hasn't sold very well. But there is some good news for those who love the playful designs of Miyamoto's games; Nintendo says it's planning on putting Mario and other popular Nintendo characters in games for tablets and mobile phones. Laura Sydell, NPR News, Los Angeles. Transcript provided by NPR, Copyright NPR. Shigeru Miyamoto is the creator of many of Nintendo's iconic video game franchises, including Mario Bros., Donkey Kong and The Legend of Zelda. NPR's Laura Sydell interviewed the 62-year-old designer at the Electronic Entertainment Expo in Los Angeles this week. Miyamoto spoke, through an interpreter, about the origins of his famous characters, how his life experiences inspire his creations and why Nintendo's latest console, the Wii U, failed to take off. Video game makers are in Los Angeles this week showing off their latest releases. Along with updates of big franchises like Tomb Raider, game developers are showcasing immersive virtual reality games. 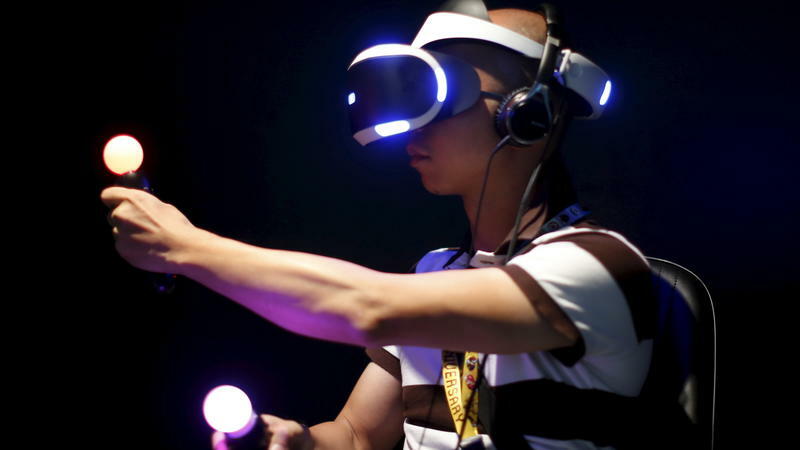 But virtual reality may not inspire love at first sight when it starts hitting the consumer market. Even if you haven't played a video game, it's likely I could describe it to you pretty vividly because you've played other video games. But with virtual reality, there isn't much out there yet to try. Some analysts say that Nintendo's days are numbered. Holiday sales of its new console, the Wii U, have been lackluster compared to Microsoft's Xbox One and Sony's PlayStation 4. But since Nintendo still offers some of the most popular game franchises, the love of Zelda and Mario may keep the company going for a long time. In preparation for this story, I put out a call to talk to die-hard Nintendo fans. I was inundated with responses. Among them, Brian White, 30, grew up playing the Zelda games. Now he's got a daughter. "We named her Zelda," he says. 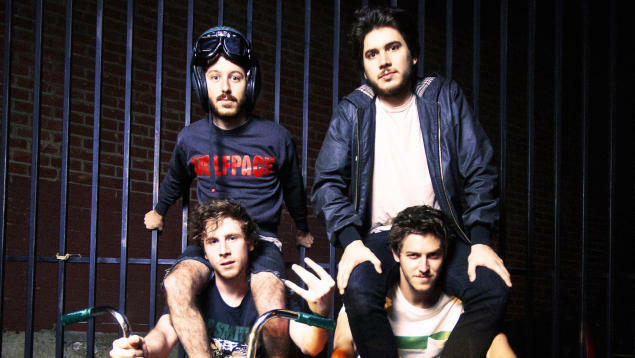 Anamanaguchi is a punk band that's part of an underground music scene known as "chiptune," an emerging form of electronic music that creates a layered sound from limited technology: video-game systems from the '80s. The group's music got its name because it combines the sound chips of old Nintendos and Game Boys with the guitars and drums of rock; it uses software designed for writing songs, then installs those songs on chips into old game machines. On stage, its members play traditional instruments like guitars and drums along with the video-game console, chirping a digital melody.